Such an approach could help many countries, including India, that in 2018 have been on the receiving end of the worst disasters the world has ever witnessed. They have included torrential rains and flooding in many parts of India, typhoons in Japan, wildfires in several parts of Europe and North America, cyclones in Fiji, and hurricanes and tropical storms in the Atlantic. In terms of casualties and economic losses, India is among the worst affected countries this year. In May, parts of North India were hit by deadly dust storms that killed more than 100 people. Just a few months later, various parts of the country are either experiencing unprecedented rains, floods, landslides, and landslips, or are in the throes of rehabilitation and rebuilding. These disasters have made detractors, skeptics, and even the uninformed in the country take note of the imminent dangers posed by climate change. This is a wake-up call, not just for India, but for the entire world. The window for climate action is closing rapidly. Swift and vigorous climate diplomacy efforts should highlight the need for recognizing “freedom from hazard impacts” as an indispensable component of human security. Just as the human security paradigm argues that protecting “freedom from want” and “freedom from fear” for all individuals is the best path to tackle global insecurity, “freedom from hazard impacts” extends the concept by aiming to reduce vulnerability and enhance the coping skills of societies confronted with natural and human-induced hazards such as floods and cyclones. In the state of Kerala, nearly 500 people have been killed in rain-related incidents since the beginning of the southwest monsoon and the estimated losses will likely amount to more than US$3 billion. Kerala witnessed the worst disaster in a century after receiving record rainfall, and the flood situation in the Northeast was equally grim. Thousands have been displaced in the states of Assam, Arunachal Pradesh, Nagaland and Meghalaya. These disasters have reinvigorated the debate on climate change as scientists are drawing attention towards the difficulty of predicting weather patterns when changes are erratic, with frequent incidents of periods of extremely high rainfall but also recurring droughts when expected monsoons fail to materialize. A specific event cannot be readily linked to climate change, as its relationship with other meteorological phenomena like the monsoons also contributes to extremely high rainfall, as experienced in Kerala. However, it is clear that the rise in the frequency of extreme weather events like floods is due to “abnormally” or “unusually” heavy precipitation events in a short period. Additionally, a “fast-warming” Indian Ocean, particularly the Arabian Sea, compounds the probability of cyclones in the region, to which states like Kerala and Karnataka are highly vulnerable, as seen with last year’s Cyclone Ockhi. Human beings, especially poor populations that are more vulnerable to climate change, need to be protected from natural hazards that turn into disasters. With the rapid rise in the number of casualties due to disasters worldwide, there is a dire need to proactively address social and environmental vulnerabilities by integrating “freedom from hazard impacts” in our security plans. While India has clearly defined a mitigation roadmap that mainly deals with the deployment and expansion of renewable energy, disaster risk reduction (closely tied with climate adaptation) is rather abysmal. When the disaster struck Kerala, the lack of a disaster mitigation plan became apparent. In fact, the state’s developmental strategy overemphasizes development, but barely considers climate change, for which the state has now paid the price. The need for “freedom from hazard impacts” has been compromised or overlooked. As a consequence, environmental regulations and risk assessments are flouted flagrantly. This is why India should now focus on developing a disaster risk reduction strategy that could minimize loss of life and economic damage. For this, measures such as zoning (of floodplains, forestland and other ecologically fragile areas), eco-sensitive building codes and guidelines for post-hazard reconstruction need to be implemented on a war footing. In the international arena, the UN’s Loss and Damage Mechanism, aimed at addressing both rapid-onset and slow-onset disasters in developing countries, is just one of the pillars that needs to be strengthened further in order to develop comprehensive risk assessment and management approaches and frameworks. India should spearhead a strategy for the upcoming UN climate talks at Katowice (COP24) to galvanize the international community to push for more action on issues such as resilience and capacity-building through financial and technological means as an integral part of the post-2020 international climate policy. The impact of hazards on societies is worsening year after year. Therefore, it is increasingly important for countries such as India to encourage multilateral institutions at international and regional levels to adopt a human security approach to minimize hazard impacts. This could be achieved by prioritizing climate diplomacy targeted at mainstreaming climate change into development strategies and policies as well as security architectures. Dr. Dhanasree Jayaram is Co-Coordinator at the Centre for Climate Studies and Assistant Professor in the Department of Geopolitics and International Relations at Manipal Academy of Higher Education in Karnataka, India. 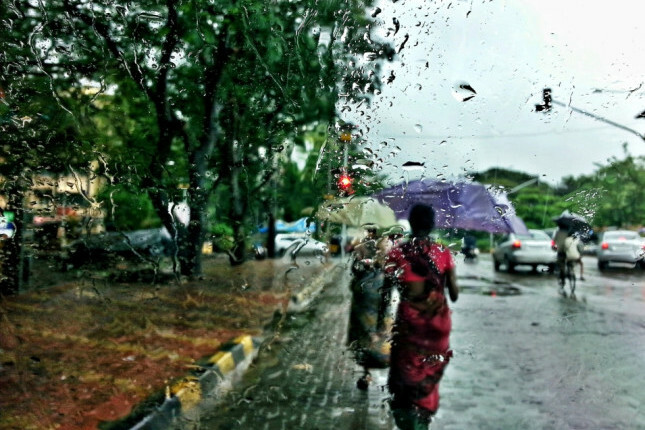 Photo Credit: Mumbai in a rain storm, July 2014, courtesy of Abhijit Chendvankar.